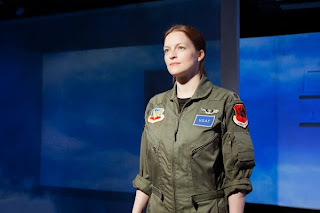 The film Good Kill will have a week-long run at Chicago's Siskel Film Center in May (May 22 through 28). 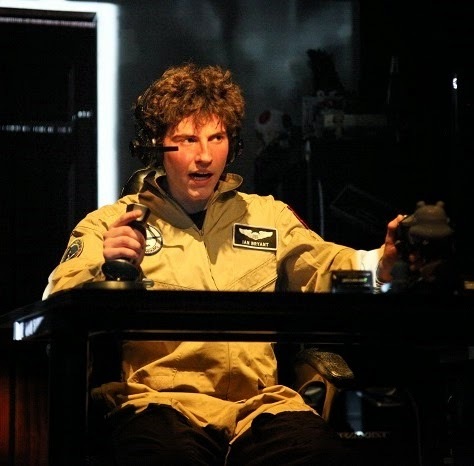 "The first film to deal seriously with America’s escalating use of drone warfare, this potent blend of war film and psychological drama centers on Tom Egan, a one-time fighter pilot who now sits in an air-conditioned trailer in Nevada and uses a video screen to fire missiles at suspected terrorists 7,000 miles away." 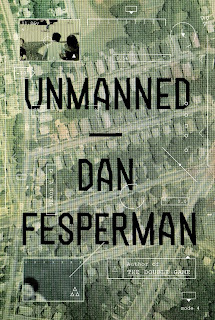 "makes a persuasive case that our blind infatuation with all-powerful technology is stripping us of our humanity . . . "
"transforming the ugly reality of battlefield carnage into a video game whose casualties are pixels on a screen . . . "
"Mr. Hawke’s anguished performance gives “Good Kill” a hot emotional center . 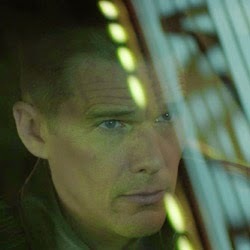 . . "
" 'Good Kill' is really a contemporary horror movie about humans seduced and hypnotized by machines into surrendering their souls . . . "
It looks like this film is a must-see for anyone who cares about the way the US wages war today. Navy tests X-47B in 2013 Al Jazeera photo. 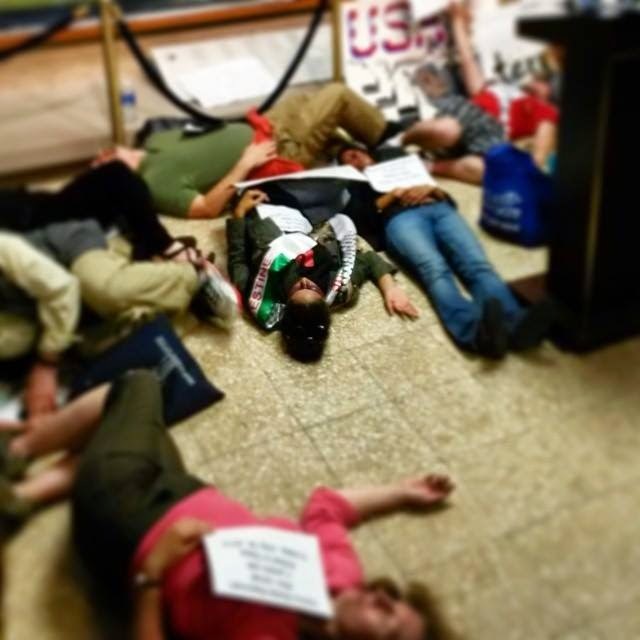 Within days of antiwar protesters making a lot of noise at the 2014 Chicago Air and Water Show -- with a strong emphasis on the role of Boeing in the killing in Gaza and in next-generation killer drone technology -- the U.S. Navy quietly conducted tests that may change the way the Navy goes to war. 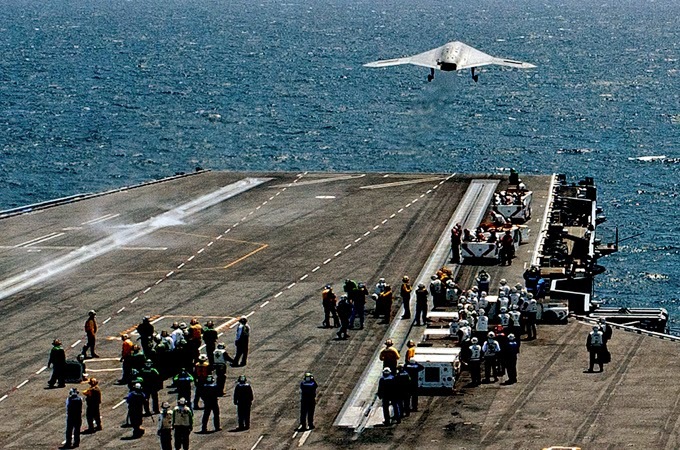 "Navy conducts first series of drone and manned fighter jet operations" by W.J. Hennigan (LA Times, August 18, 2014) describes the first tests of carrier-launched killer drones working in tandem with fighter jets. The experimental drone being flown that day was a Northrup Grumman version (X-47B) of the next generation killer drone; the fighter was the F/A-18 - the Boeing fighter being used for renewed bombing in Iraq. W.J. Hennigan has done consistent reporting on the move towards drones in the Navy. 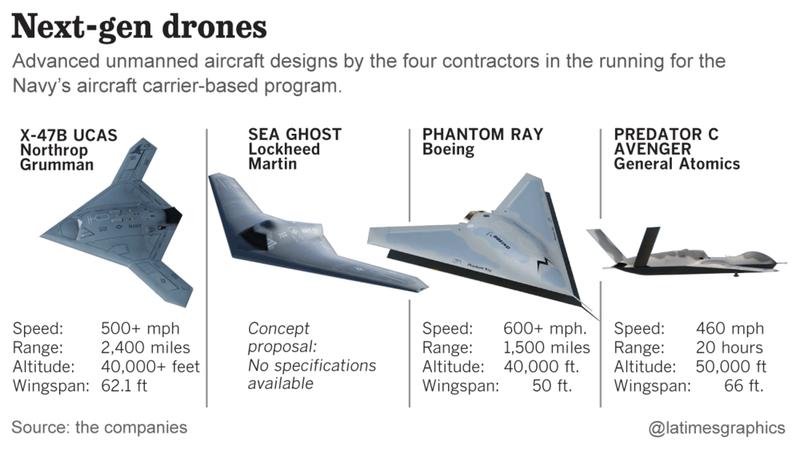 In "Navy plan for carrier-based drones takes flak from lawmakers," he explains the role of multiple defense contractors -- including Boeing -- in developing next-generation designs for the killer drone. developing next-generation carrier-based killer drones for the Navy. Hennigan says the dronificaition of the Navy will be tough for a lot of people in the aviation part of the Navy to swallow. Apparently Navy people think in terms of manned aircraft, and want drones to stick to reconnaissance; the people in Congress who are pushing the appropriations see massive spending (and employment) from the unmanned drones, and want those drones to do have the fullest possible range of bombing capabilities. The stakes are high -- including impacting other major defense programs. "A deep-penetrating stealthy drone that could fly farther and longer could be seen as a potential challenger to the nearly $400-billion F-35 program," Hennigan reports. For more background, see the Wikipedia article on the Unmanned Carrier Launched Airborne Surveillance and Strike program. 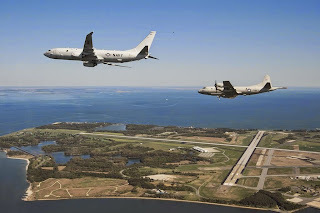 Just as it did in 2001, the U.S. has had another close dangerous encounter between one of its surveillance planes and a Chinese fighter in the air near the coast of China. Like the 2001 event, it's making a lot of people ask what the hell the U.S. is doing provoking China where they live. 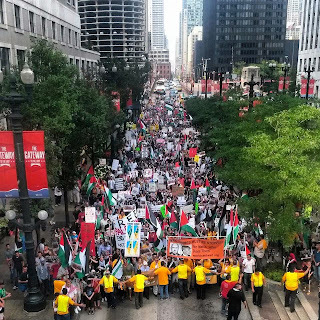 No Drones Illinois has endorsed the following call by Anti-War Committee – Chicago, Jews for Justice in Palestine, U.S. Palestinian Community Network and 8th Day Center for Justice: Protest Boeing Death Machines in Gaza: Demand Chicago Drop Boeing from Air and Water Show! 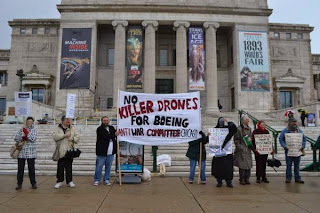 "The U.S.'s use of drone warfare has resulted in the deaths of hundreds of children, many of whom live in countries where we have not declared war, yet Boeing has decided to pursue a Navy contract for the prototype for the next combat drone. 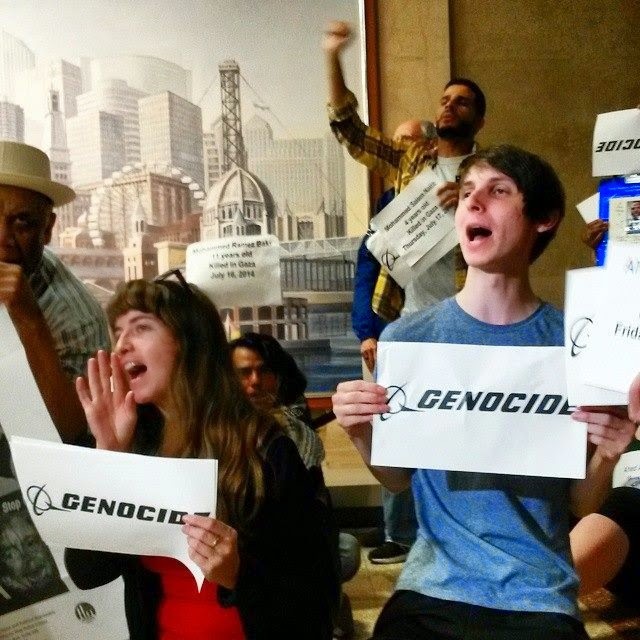 This is unacceptable", said Kait McIntyre of the Chicago Anti-War Committee (AWC), at the annual stockholders' meeting of the Boeing Corporation. People in Chicago like to walk down the street and look the other way, saying, "This doesn't have anything to do with me." When you ask them to take a flyer, or to learn more about this problem, they wave it away with a bland, "I'm good . . . ."
U Chicago Exhibition: "Drone of Testimony: A Vigil Against US Drone Attacks (2014)"
Be sure to see (and hear and participate in) this exhibition at the University of Chicago - it runs through August 30, 2014. "David Boykin’s initiative Sonic Healing Ministries “believes in the power of sound/vibration to transform physical matter. 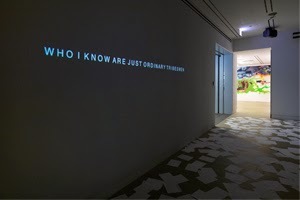 Thought is a finer vibration that has the potential to shape the physical world, as our thoughts eventually manifest in the physical world.” His project for the exhibition, Drone of Testimony: A Vigil Against US Drone Attacks (2014), produced in collaboration with the sound engineer Angel Elmore and the researcher Kasandra Skistad is a vigil against US military drone attacks. 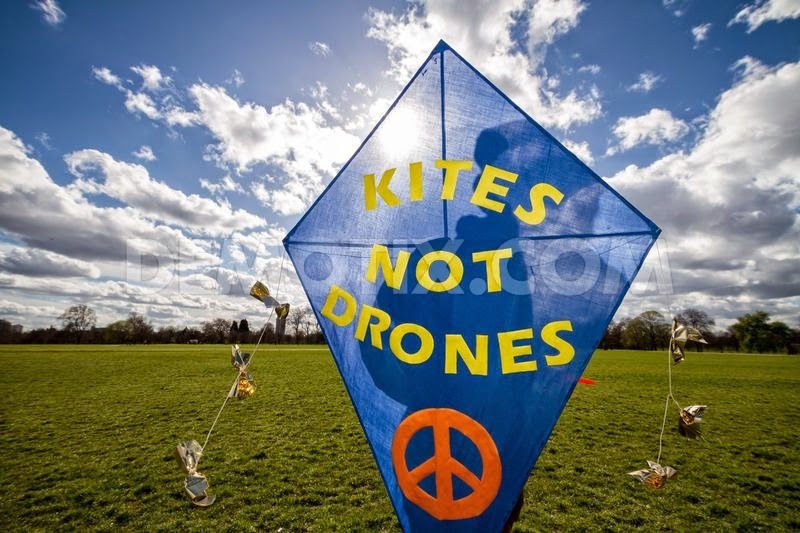 As the artist writes: 'The sonic drone that is created out of the testimony of US military drone attack survivors is a vigil against future attacks. Some people light a candle, we make a sound. Let there be a fire always burning, a song always sung, a sound always resonating until this madness stops. Let there be a Drone of Testimony till there are no more drone attacks.'" 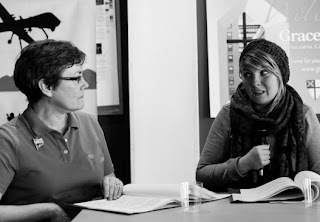 The exhibition is part of the larger exhibition: Testimony. More about David Boykin: David Boykin is one of the most original and dynamic artists in the Chicago music scene. He is a composer, bandleader, and multi-reed instrumentalist performing on the tenor and soprano saxophones, the soprano and bass clarinets, and the drum set. He has received many grants and awards for his talents as a composer. He is the leader of the David Boykin Expanse, founder of Sonic Healing Ministries, and an occasional collaborator with a few other artists. Boykin began studying music on the clarinet at the age of 21 in 1991 and first performed professionally in 1997. Since 1997 he has released 10 album-length recordings as a leader, contributed as a featured soloist to other musicians’ recordings, and performed at major international jazz festivals and smaller jazz venues locally and abroad. As part of his residency, Boykin’s Sonic Healing Ministries has been holding Free Jazz Jam Sessions, each Sunday at 2-5pm in his studio at the Arts Incubator in Washington Park. 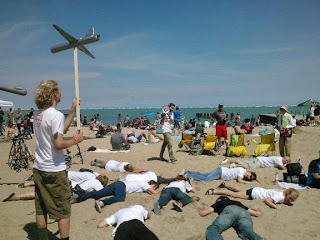 Demand Chicago Drop Boeing from Air and Water Show! 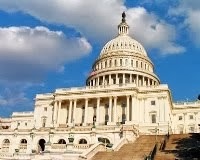 Wednesday, July 30, 10:00 a.m.
Chicago Coalition to Shut Down Guantanamo. More links and discussion on the Facebook event page. dropped by the City of Chicago as a sponsor of its annual Air and Water Show. 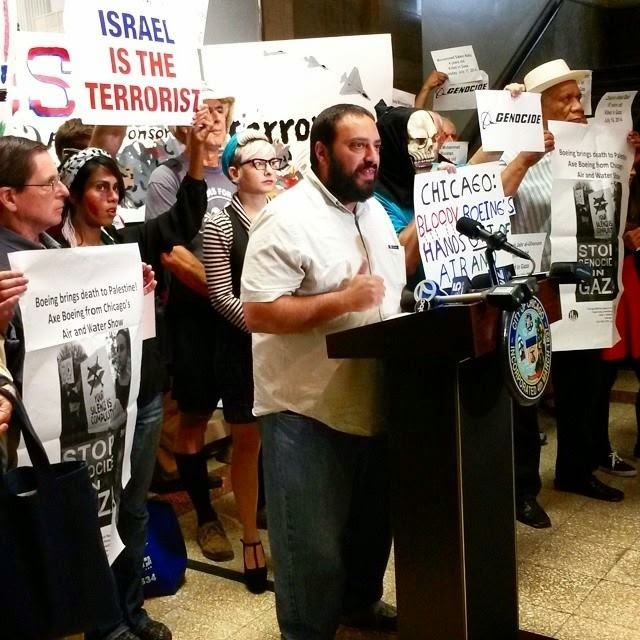 Hatem Abudayyah spoke on behalf of U.S. Palestinian Community Network. used to kill Palestinians in Gaza. 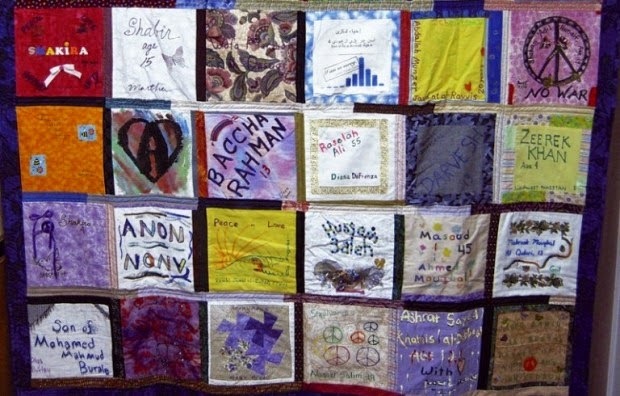 of many Jews to stand in solidarity with the Palestinian people. 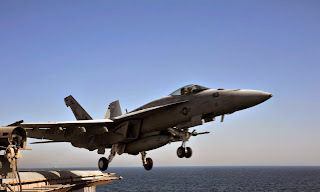 the fighter jets and attack helicopters of Boeing. 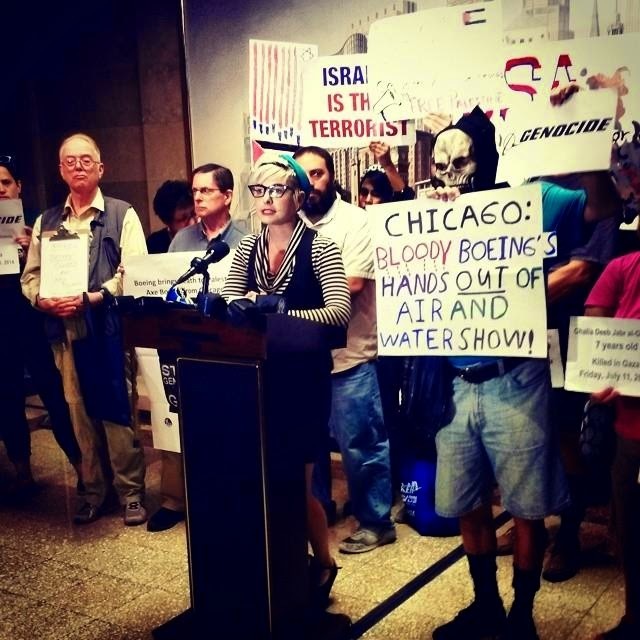 Press conference attendees say Boeing is enabling the genocide in Gaza. Boeing Company is a major sponsor of Chicago’s annual Air and Water Show this summer. 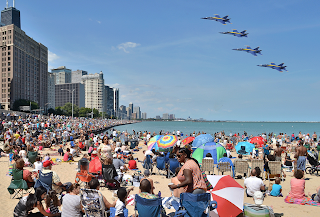 Many people come to the lake shore every year to see displays of jets and other aircraft. Boeing weaponry are responsible for many of the over 1000 dead and over 6000 seriously wounded Palestinians in Gaza in the past three weeks. The dead are mostly civilians, including over 200 children. Israel’s fighter jets – the F15s and F16s – as well as Apache helicopters are all made by Boeing. Boeing has made billions from the sale of weapons for use in Israel's attacks, as part of its eight year old siege of Gaza. 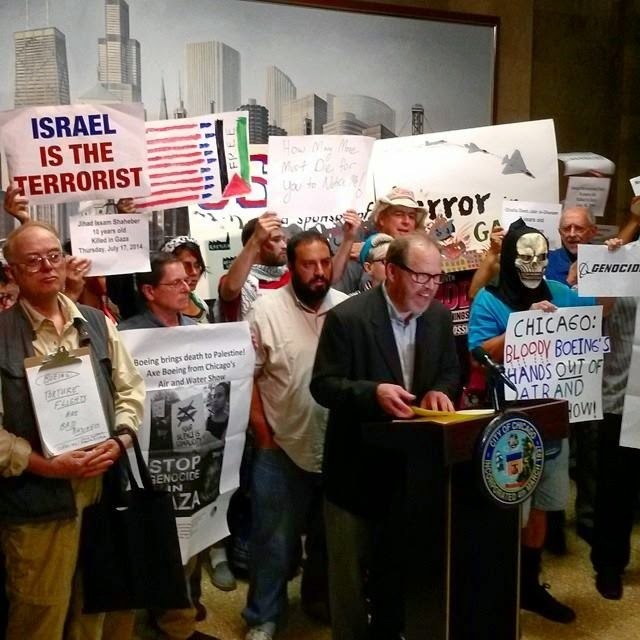 The City of Chicago should drop Boeing from the sponsors of the Air and Water Show. No company that makes profit from the slaughter of civilians should be included. 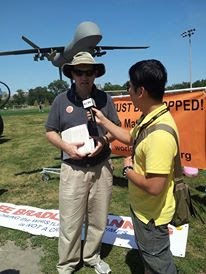 Coming off our experience this past weekend once again protesting against drone killing, drone surveillance, and related acts of militarism at the Chicago Air and Water Show, I am more confirmed than ever in my view that air shows are a very effective place to get our message out to the public. 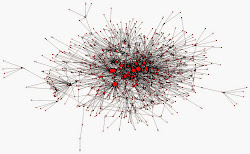 When Chicagoans fully succeed in fully connecting the dots -- especially to the crimes being committed in their name with their tax dollars and the weapons produced by their favored corporate citizen, Boeing -- I think there will be some new and different phone calls taking place . 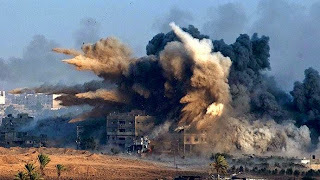 . .
Now that the Israeli government's killings in Gaza are front-page news -- particularly the way military aircraft is being used to mow down innocent men, women, and children -- Boeing's involvement is in everyone's face. 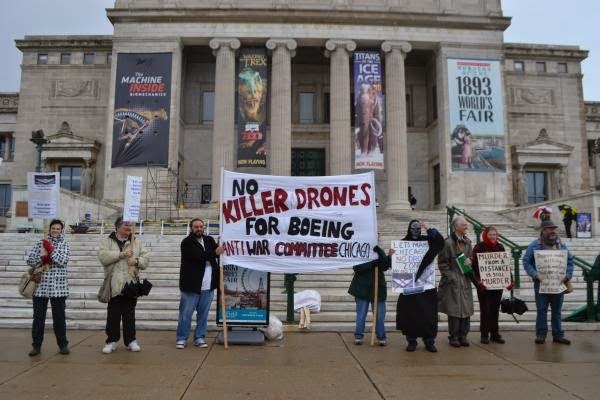 As reported on local TV news, at Fight Back News, and by Progress Illinois, Dozens of activists came to the Field Museum in Chicago last Monday (4/28) to speak out against Boeing's involvement in developing the next generation of killer drone. 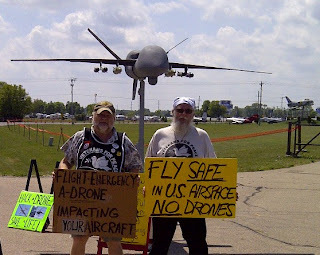 Supporters of No Drones Illinois will join with other opponents of U.S. military aggression and surveillance to protest at the 2014 Chicago Air and Water Show on August 16 and 17. 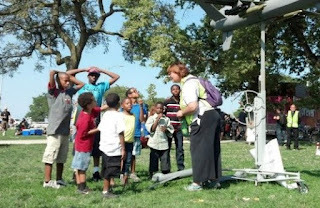 For the third year in a row, No Drones Illinois supporters will do public outreach at this event. Full information on 2014 plans is on the website of the Chicago Coalition to Shut Down Guantanamo. 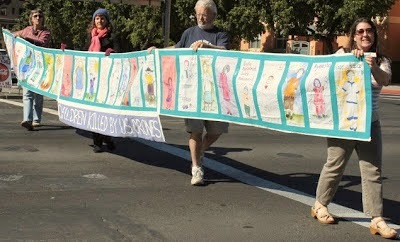 A large contingent participated in creative resistance activities at the 2012 Air and Water Show. August 19, 2013 -- We had an outstanding day on Saturday at the Air and Water Show! There was an antiwar presence in at least three distinct locations: east of the North Avenue Bridge with the Free Bradley Manning Contingent, representatives of the Anti-war Committee of Chicago, World Can't Wait, and allies from the north and west suburbs on the west side of the North Avenue Bridge, and members of Occupy Chicago on the bridge itself, as well at various places along the beach. "Overall, a great success," said David Soumis. "We had a lot of people riding by in cars, buses, trucks, and golf carts. A lot of thumbs up, a few one finger salutes, a lot of questioning glares, and tons of people that could only see the hood of their car."